Boyle Heights families file lawsuit against mega KIPP Charter School, urge support for UTLA teachers strike | Fight Back! 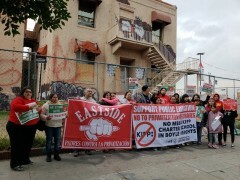 Los Angeles, CA – Residents of the Boyle Heights neighborhood, joined by families of students of local public schools, announced, at a January 5 press conference and picket, the filing of a lawsuit in Superior Court against the city of Los Angeles and KIPP Promesa charter school to stop the mega project. KIPP Promesa wants to build a large charter school at the former Lincoln Hospital in Boyle Heights. On January 4, attorneys with Advocates for the Environment filed the lawsuit in Los Angeles Superior Court against the city for failing to conduct an Environmental Impact Report (EIR); and asking to halt project due to the harmful impact to the already damaged environment. Boyle Heights Neighborhood Association, with Centro CSO, state that the proposed mega projects will have adverse impact on the environmental conditions by adding more pollution, traffic and noise to the already harmful situation. The mother of Breed Street School student Rosa Bonilla stated, “this mega school will have long lasting damaging impact to local public schools by draining students and needed funds.” Bonilla her family live next door to proposed project and fear the added pollution. Centro CSO calls for a new public library, a public park, or affordable housing, at this site. There already exist many schools in Boyle Heights, both public and charter. Roosevelt High School, Hollenbeck Middle School, Breed School and Saint Mary Catholic School are within one or two blocks from proposed project. Lucia Garcia, a local teacher at Malabar School, spoke about the growing community support for the pending teachers strike. The UTLA demands stricter control of charter schools, which are seen as an attack on public education via privatization. 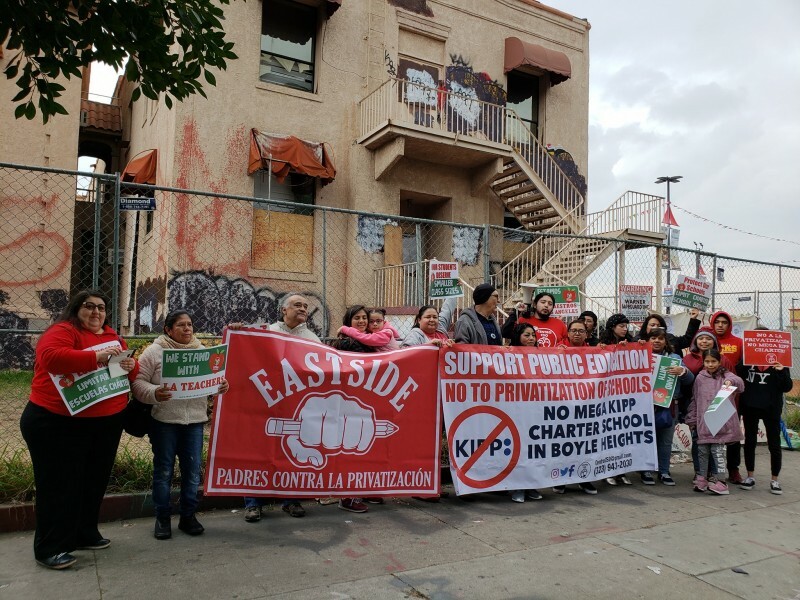 Centro CSO and Parents Against Privatization are working to stop the growth of charter schools in East LA and Boyle Heights. The KIPP Promesa charter school proposal is to build a large elementary school for 625 students in an already dense and polluted area, which is already served by many local schools. KIPP currently operates a school in Boyle Heights on Whittier Boulevard, next to the YMCA, and three KIPP schools in ELA, one on Atlantic Boulevard near Garfield High School, one on Chavez and Mednick, near Hamasaki School, and another on Olympic Boulevard near Eastman School. Luis Sifuentes, member of Centro CSO, and Eloisa Galindo, a local parent, led the students and parents in loud chants opposing KIPP Promesa and in support of the UTLA teachers strike. Centro CSO calls on LA residents to join the UTLA strike by joining a picket line at your local LAUSD school.